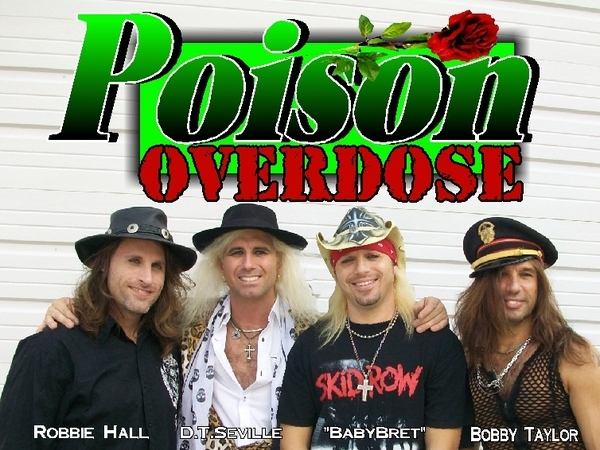 Poison Overdose provides a premier big-hair-band 80’s rock concert experience, complete with confetti, silly string, a very active stage show, and an accurate look to match one of the best, most entertaining, and truly fun bands of that musical era – Poison. They have been performing for over 10 years, playing shows in every possible region within the USA, and has established itself as the top-tier Poison tribute band in the world. Poison Overdose has regularly performed warm-up concerts for such 80’s acts as Slaughter, Quiet Riot, and others. Professional, talented, reliable, entertaining, and easy to work with. Let them bring the magic and fun of the 80’s hair-band era to your event. They will provide you piece of mind that you are bringing in one of the top tribute acts. From private small parties and corporate events to fairs, festivals, and 10,000+ person arenas. They have done and can do it all. Poison Overdose is always a fan-favorite where ever they perform. They consistently treats fans, support staff, and show attendees with respect and kindness.